Breaking down the billionaire trader's three best stocks in the new year. Love him or hate him -- casual interest or indifference will also do -- there's no denying hedge-fund billionaire George Soros' considerable skill predicting and profiting from the movements of financial markets. In a career spanning over six decades, Soros has amassed an estimated $25 billion fortune entirely through trading and investing stocks, bonds, currencies, and the like. His place at the center of some of the most lucrative and high-profile trades ever -- once earning himself over $1 billion personally in a single day after breaking the British pound -- solidified his place in investing lore. 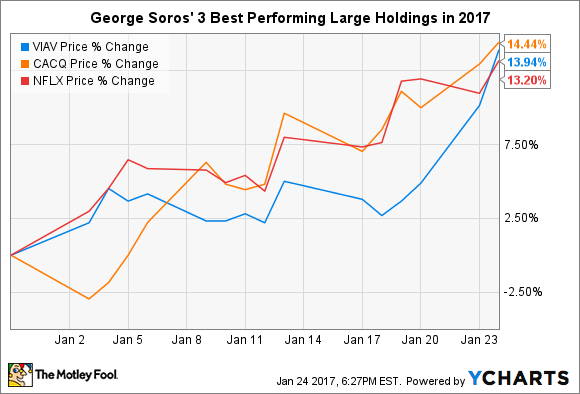 Soros returned to active trading last year, just in time to lose a reported $1 billion when bearish bets suffered after the post-election rally. Should you follow suit and consider investing in any of these names? Let's quickly review George Soros' top stocks, and consider how individual investors might think about them. In what finally appears like the end of a long and painful bankruptcy process, shares of Caesars Acquisition Company (NASDAQ:CACQ) have risen on news that its sister company Caesars Entertainment Corp. (NASDAQ:CZR) -- the complex transaction that led to their creation was described by my colleague Travis Hoium -- reached a bankruptcy settlement with its creditors earlier this month. It's easy to get bogged down in the web of complex ownership associations between Caesars Acquisition Company (CAC), Caesars Entertainment, and numerous additional claimants. However, the long and short of it is that CAC was spun off as the "Good Caesars" to own and operate Caesars' best gaming assets, while Caesars Entertainment was the debt-laden "Bad Caesars," whose substantial debt burden triggered the bankruptcy proceedings. You can delve into the myriad of details if you so choose. The high-level explanation for Caesars Acquisition Company's rally, though, is that it will soon recombine with its sister company and return to the business of making money, rather than fighting its creditors in court. The start of the year has welcomed shares of Viavi Solutions (NASDAQ:VIAV) with open arms, including a 5% stock-price pop earlier this week. The news appears to be driven by Viavi's launch announcement of its CERTiFi cloud-based project management software. According to the company, CERTiFi will simplify the management of large-scale enterprise cabling and maintenance projects, by creating a single technology solution to connect project administrators, designers, technicians, contractors, and more. Having a single platform for project execution should improve coordination and overall team effectiveness for projects like data-center maintenance. Viavi's CERTiFi platform is an efficiency play pure and simple, one that should help bolster the company's top-line growth, which is expected to decline in 2017 and remain flat in 2018. At 44 times earnings, Viavi Solution's stock certainly doesn't appear cheap, though the company has notably beaten earnings-per-share expectations in each of its past four quarterly reports. Though it's difficult to say exactly how significant an impact CERTiFi alone can have on the company, the recent investor enthusiasm surrounding the announcement is certainly an encouraging sign for those interested in Viavi stock. Shares of streaming powerhouse Netflix (NASDAQ:NFLX) have continued their seemingly constant march upward thus far in 2017, largely on the back of another impressive earnings report earlier this month. Its full-year 2016 earnings are truly those of a great company coming into its own, though admittedly with some continued room for improvement. Netflix added 19 million new users in its fiscal 2016 to end the year with nearly 94 million paying subscribers. Its U.S. business has flourished as a budding profit center, providing investors with a glimpse of just how profitable the company could become when its international business eventually matures. The momentum shows no signs of stopping, either. Looking to its current quarter, Netflix indicated it expects to add 5.2 million members globally, and it believes its international business will achieve a 7% operating margin. Netflix shares certainly aren't cheap, but the company's continued execution just goes to show why Netflix earned a place as one of Soros' best-performing stocks so far in 2017.